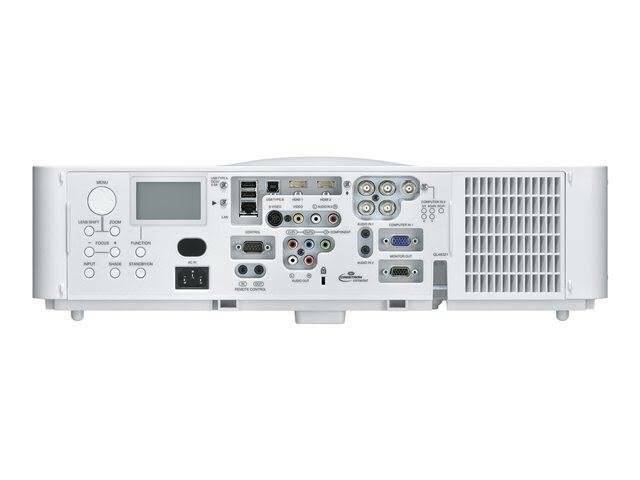 As a 3LCD projector, the Hitachi CP-A352WN enjoys some advantages over business DLP-based machines. First, the CP-A352’s 3LCD lamp achieves a brightness rating of 3,500 lumens. That’s substantially brighter than similarly priced DLP projectors. The reason: 3LCD projectors typically perform better in brightness tests, thanks to their light creation technology. Secondly, the CP-A352 is immune to rainbow artifacts, which is a common video problem with budget single-chip DLP machines. Overall, the CP-A352WN is a solid multimedia projector. It has built-in audio, provides a robust suite of wired networking options, achieves long-lasting lamp performance, has a range of connections, and is capable of PC-less presentations. Plus, it’s an ultra-short throw projector – capable of delivering an 80-inch image from about 1.5 feet from the screen – which is super important for small spaces like classrooms and boardrooms. 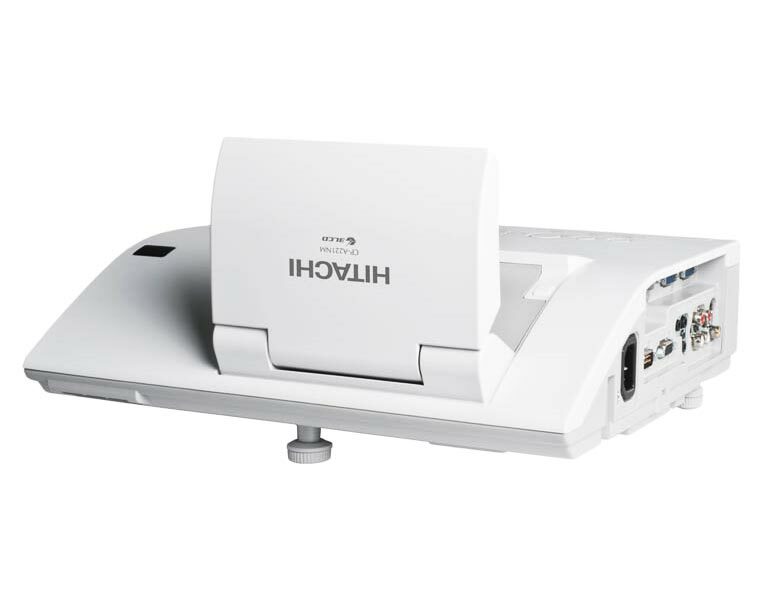 Even though the Hitachi CP-A352 has been out of production since September 2014, it remains a viable option for business and classroom presentations. Fortunately, new versions are still available online, starting at around $1,399, and that makes the CP-A352 even more attractive as a replacement multimedia projector. 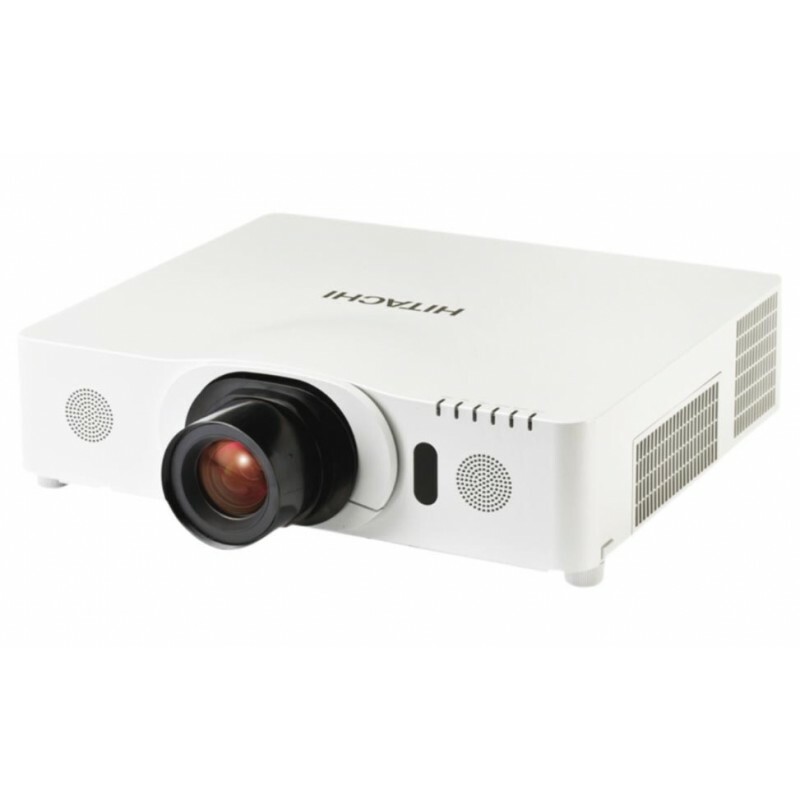 The Hitachi CP-A352 is a utilitarian business tool, and the projector’s feature set highlights this no-frills design. For instance, wired networking, PC-less presentations and even wireless presentations (with an available adapter) are all possible. While image quality is about average, more advanced image features like PC 3D capabilities, optional lenses, and lens shift, aren’t available. In other words, if you’re looking for a machine for regular video and highly defined images, this might not be the best option for you. Powerful Networking Features. There are a range of options when it comes to networking. First, the projector can be wired into a local network, enabling the projector to be controlled remotely. When networked, the CP-A352 can pull data and presentations from other computers on the network. Plus, an available USB adapter makes it possible for presenters to do wireless presentations, essentially drawing the slides from an office computer. Lamp Performance. LCD lamps tend to outperform standard UHP lamps, lasting longer overall. But the Hitachi CP-A352 does not have an LCD lamp, instead it uses 3 LCD panels for light creation. The projector is powered by a UHP, 215-watt bulb that delivers 2,500 lumens of brightness in standard operating mode. In the energy-saving mode, the lamp life is extended to 4,000 hours. Fortunately, the Hitachi CP-A352 replacement lamp starts at $222 – part no. DT01411 – a small investment in improved performance. Image Quality. Overall, image performance is solid for the CP-A352. 3LCD projectors tend to have lower contrast, compared to DLP-based units, but with a contrast ratio of 4,000:1, the Hitachi performs well. The images are crisp, and the colors are saturated. Video performance is also decent, but as a 3LCD projector, a slight motion blur can be noticeable during videos. If you’ll be showing lots of videos, you might consider a DLP alternative. Portability. At just 8 pounds, the projector can be taken just about anywhere. Its body is slightly larger than DLP based projectors (3x13x12), but remains reasonably small. In addition, the ultra-short throw lens, makes it possible to fit this projector into even the tightest of spaces. Bottom line, the Hitachi CP-A352 is a decent 3LCD projector that provides a ton of business flexibility. As a 3LCD set-up, it has its advantages and limitations – i.e. reduced quality video, less contrast. But in all, it performs extremely well and offers a range of features. For standard business or classroom presentations, there’s a lot of value in the CP-A352. The CP-X8170 is Hitachi’s top-of-line, large-venue projector, and as such, it carries quite the price tag. The CP-X8170 is available starting at around $8,000. Even so, the CP-X8170 provides plenty of benefits. The image is vibrant and bright, rated at 7,000 lumens. Its vertical projection capabilities and range of optional lenses provide installation versatility. And the advanced networking and security features are useful for education institutions, churches and conference venues. In the large-venue category, the CP-X8170 is a formidable competitor. The projector can be stacked, to enhance brightness or create immersive environments, and the images are crisp and clear. The biggest disadvantage, of course, is price. It’s firmly at the higher-end of price range for large-venue projectors. But yet, it delivers quite a bit of functionality. Bright Image, Moderate Contrast: The 3LCD Hitachi is equipped with a 7,000-lumen light source. That’s sufficient brightness for large venues – think 1,000 person churches and conference venues – and that means the image can compete with ambient light. With a contrast ratio of 3,000:1, the images are crisp and clear. Advanced Networking: With both wireless and wired networking functions, the CP-X8170 can be controlled remotely. That’s an ideal feature for venues, as the projector can be connected to and controlled from a booth. Security settings, on/off, email notifications and scheduling can all be controlled over your LAN. More affordable options aren’t always network connected. Range of Connectivity: There’s a lot of options when it comes to connecting sources, including 2 HDMI inputs, a USB-A port (enabling presenters to plug-and-play presentations from a USB drive), and the ability to connect and display images and documents from a mobile device. Side-by-Side Picture: The CP-X8170 offers two different types of picture-in-picture; a traditional picture-in-picture as well as a side-by-side configuration. With side-by-side, two images from just about any source (for example, two HDMI sources) take up equal shares of the screen. This is an important feature for presentations. Available Optical Lens: There is a solid range of optical lens available for the CP-X8170 including Fixed Short, Short, Long, and Ultra Long. This makes it possible for operators to configure the projector to fit the venue. The largest venues benefit from the Ultra Long throw lens, while smaller venues, or those that can accommodate the projector closer to the screen, might choose the Short or Fixed Short. 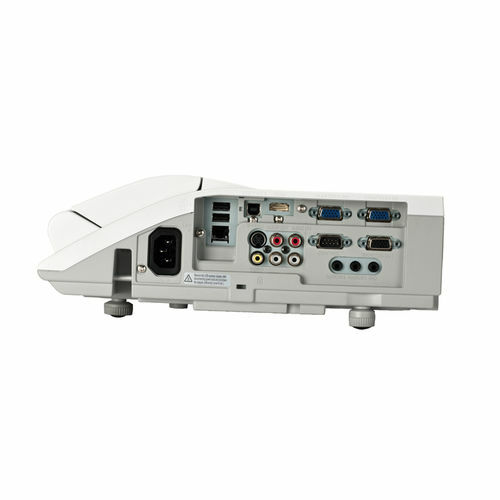 Overall, this provides flexibility, allowing the projector to be repositioned. Long Lamp Life: Given the CP-X8170’s 7,000-lumen output, the Hitachi still delivers 2,000 hours of lamp life in its standard operating mode, and up to 3,000 hours in economy mode. That’s really impressive considering its power. Fortunately, the replacement lamp and housing module for Hitachi CP-X8170 – part No. DT01471 – doesn’t cost a premium, starting at $260 for the bulb alone. That keeps the maintenance costs low for this projector. Overall, the Hitachi CP-X8170 is a powerful piece of hardware, providing operators with a range of functionalities. It can be used for performances – casting set pieces onto a stage – or high-quality presentations in large venues. True, the price is high, but you’re paying for an extremely useful piece of hardware. If it’s in the budget, the CP-X8170 warrants your attention.